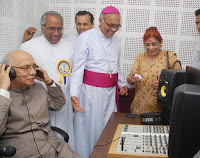 Karnataka Governor, H R Bharadhwaj, launched the Community Radio Sarang 107.8 FM at St Aloysius College (SAC) on Wednesday, 23rd September 2009, with the inauguration of the radio studio. TV Studio also was inaugurated at the College, along with the inauguration of the radio station. After the launching ceremony of Radio Sarang, the Governor of Karnataka speaking on Mass media and social responsibility, stressed upon need for independent media which is assessing good and bad in the society, which is a greater need for today’s society. Media and the judiciary are the two major wings of the Indian constitution, should never be allowed to get polluted. Both are the ways of finding out the truth, especially the media goes searching for the truth. Media has got lot of responsibility towards the society and truth shouldn’t be diluted. Union minister for law and justice, M Veerappa Moily, speaking on the theme, ‘Challenges to law in the 21st century in the context of cyber crimes, a single PC is enough to commit cyber vandalism. There is an immense need for the amendment of cyber crime law. Union government is contemplating to enact a law to deal with all the cyber-related crimes. The young generation should be prepared to face all the challenges to effectively deal with such crimes in future, he advised. Bishop of Mangalore Diocese, Fr Aloysius Paul D’Souza, graced the occasion. Home minister of the state, Dr V S Acharya, member of the parliament, Nalin Kumar Kateel, member of legislative assembly, U T Khader were present. Fr Francis Serrao SJ, president of Karnataka Jesuit Educational Society, Fr Swebert D’ Silva, principal of the college, rector Joseph Rodrigues, Fr Richard Rego SJ, director of Sarang and Naveen N, Chairman of ICAI and the wife of the Governor, Prafulatha Bharadwaj were also present.